Famoso Neapolitan Pizzeria is curing comfort food cravings with its new fall menu, available starting today at all Famoso locations. Perfect for the cooler fall and winter months, the menu features the brand-new Patate Pancetta Pizza, Korean BBQ Beef Pizza and Mac + Cheese Pasta, as well as the return of the Funghi pizza, a seasonal favourite. 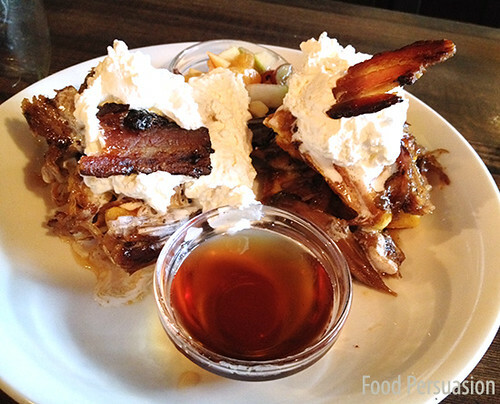 Buckstop is a casual little rustic bar and restaurant in the West End that specializes in BBQ meats. A tiny restaurant with dark rust colored walls and long wooden tables. We headed to Buckstop for brunch. 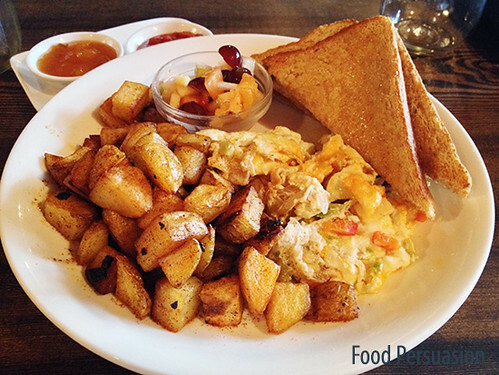 Brunch prices are one of the cheapest that I have seen in town, let alone downtown. You can get a classic breakfast for $6 and ranged to $12 their most expensive brunch item, smoked brisket breakfast sandwich. She sat us down handed us our menus and left. We ordered the vegetarian cheese scramble fresh tomato, avocado, cheddar with a side of hash and toast. I changed it up and requested for egg whites only. Everything including the chipotle ketchup and chutney was made inhouse. A simple dish with simple flavours but, very fresh. The eggs were not over scrambled and the inhouse made ketchup went amazingly well with the lightly seasoned hash, giving it a nice kick. Cornbread Waffle & Pulled Pork Sliders $9, whisky maple syrup (alcoholic in me was dancing), whip cream and candied bacon. Now if you don’t have a sweet tooth then I would advise you to order something else. This was diabetically sweet and heavy. The waffle was soggy and swimming by the time it arrived to our table, I suggest you order the maple syrup on the side. The pulled pork itself was delicious, nice smoke and a bit of crunch. Now my biggest pet peeve. When this happens your dining experience would go from gastronomically stunning to train wreck within seconds. I absolutely abhor it when they fail to disclose additional costs to dishes when I order. I feel like I’ve been swindled. Never assume people know that there are additional costs to substituting any part of their dish. What pissed me off even more was her attitude and response to when I questioned why my omelet was $3 more, that’s a 43% price hike. She gave me a look like I was stupid and snarled, well it always is. WTF?! How was I supposed to know that? This is my first time here and after my experience it would be my only time here.